An adult white-tailed eagle hunting for fish for her young chicks. Photograph by Valerie O'Sullivan/Golden Eagle Trust. 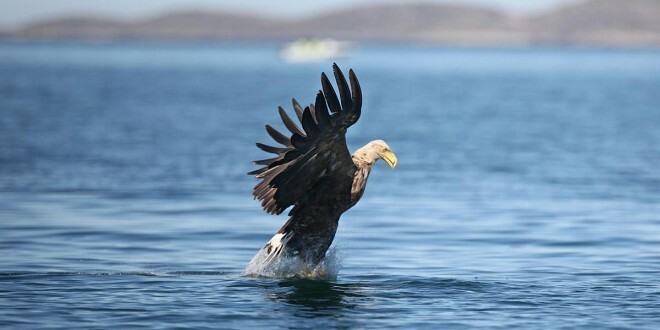 The Mountshannon white-tailed sea-eagle pair, Saoirse and Caimin, has welcomed a new addition to their feathered clan, as the first white-tailed sea eagle chick is born in East Clare under the national re-introduction programme this year. The Golden Eagle Trust has confirmed that the sea eagles had been minding two eggs in their Mountshannon nest for over a month and, two and a half weeks ago, they believe the eggs hatched. One of the chicks has survived and the Trust confirmed this week that the surviving chick is doing well. The pair created history in 2013, when they reared the first chicks to fly from a nest in Ireland in over 100 years. A new nesting pair at Glengarriff was the first pair to hatch chicks this year, in late April. Unfortunately, the breeding efforts of this pair and a pair nesting in Killarney National Park failed, probably due to a combination of poor weather and inexperience. The East Clare chick is the latest addition to the high-profile reintroduction programme, which began in 2007, with the release of 100 young Norwegian eagles in Killarney National Park, as part of the White-tailed Eagle reintroduction programme. Minister for Arts, Heritage and the Gaeltacht, Jimmy Deenihan commented, “This is a very promising development. I, along with many others, was shocked at the killing earlier this year of one of the two white-tailed eagle chicks born last year. That was a dark day for this ambitious project, to reintroduce these magnificent birds of prey into Ireland. The breeding pair in Mountshannon has proven to be a benefit to the local economy and I am confident that the continued presence of the eagles will lead to a growth in sustainable tourism in the area. While the parent eagles started their Irish lives in Killarney National Park, I believe that now they belong to the people of the East Clare, who have already proven themselves to be worthy custodians and caretakers,” he said. The pair has nested on a different island on the bay in Mountshannon and, although the birds are visible from the harbour area, this he feels is a more secure location for them than Bushy Island, where they were previously. Speaking about the development, Dr Allan Mee, project manager for the Golden Eagle Trust, said last year’s successful nesting in Clare was a milestone for the species recovery in Ireland. “Ultimately, the viability of the reintroduced programme depends on these chicks going on to breed themselves, in Ireland. Each step brings us closer to that goal. Many people have helped us reach this goal over the years. We especially wish to thank local communities in Mountshannon and Whitegate, for their goodwill and continued support. The eagles have benefitted from widespread support from communities and landowners. Their presence has the potential to enhance the rural economies of these areas, especially through wildlife tourism,” he said. Dr Mee advised the people of Mountshannon and visitors alike that the sea eagle pair will be more visible from the shore of the lake over the next few weeks, as they forage for food for their newborn chick. He warned, however, that this is still a sensitive time for the eagles and to maintain distance from them.